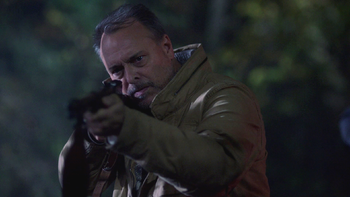 Smithy was one of the Apocalypse World refugees who became a hunter under Sam Winchester's leadership. Smithy is one of the many refugees from Apocalypse World working in the Bunker, having made a pot of soup to feed the other hunters. After learning of a band of vampires who have been picking off truckers, Sam asks Smithy to call another hunter named Sharon and her crew to get all hands on deck to deal with the vampires. Smithy is one of the hunters gathered by Maggie to try and stop the monster rampage in Kansas City. When a van holding monsters rolls up to the hunters' roadblock, Smithy is among one of the first to notice that the van is empty. When the group arrives at the Bunker, Smithy has his throat slashed by a rugaru, killing him. This page was last edited on 12 February 2019, at 11:04.